The Umpire Ejection Fantasy League announces its 2017 UEFL Rules Summit, our annual forum for discussion of controversial issues which may have surfaced during the past season, setting forth a framework for rectifying these issues by amending the existing UEFL Rules Book ahead of the 2018 UEFL season. This discussion thread is an open colloquium for proposal, discussion and debate of potential rules changes. This thread will remain open through Thursday, November 16, at which time voting will proceed—voting will not occur prior to that date. This will provide ample time for proposal and subsequent discussion of possible rules changes for the 2018 season. If necessitated by certain below decisions, a Summit runoff ballot may be presented after the initial voting closes. COMMENT: Adds a second crew to chief to list of drafted umpires (2 cc + 2 PRM + 2 SEC = 6). COMMENT: Replaces current 1 cc + 2 PRM + 2 SEC crew with 1 cc + 1 PRM + 1 SEC + 1 Fill-In. >> 1-5-b. An umpire may be replaced pursuant to 1-5-a if the originally drafted or replaced umpire has missed at least 30 consecutive days during the season. COMMENT: Authorizes replacement of a clearly absent or injured umpire midseason. >> 1-5-c. Up to one umpire of any class, regardless of injury status, may be replaced at the All-Star Break pursuant to the procedure prescribed in UEFL Rule 1-5-a concerning points structure. COMMENT: Authorizes a midseason "trade" or replacement of no more than one healthy drafted umpire. COMMENT: Changes present rule (+0) to (-1) for an incorrect call by a crew chief's crew. >> 4-2-a-1. 3 points for each non-incorrect ejection by a primary AAA umpire; OR a. In the event of an ejection resulting from an incorrect call, either by himself or a crewmate, the AAA Umpire will receive just 2 base points instead of 3 points. COMMENT: Eliminates bonus point for QOCY and QOCU ejections by a AAA-level umpire. 4-2-b-3-ii. +1 points, applied concurrently with -4 QOCN (thus, -4 + 1 = -3) for a QOCN ball/strike ejection wherein the umpire achieved 93.0-94.9% accuracy for the entire game. COMMENT: Allows umpire to earn points to mitigate the -4 QOCN penalty based on whole-game performance. >> 4-3-c. Post-season appearance points... (1) Wild Card +2, Division Series +3, Championship Series +4, World Series +5. COMMENT: Adds one additional point per round for on-field postseason umpires. >> 4-4-h. An umpire recognized as Most Declining Umpire of the Year (min. 0 / max. 1 umpire) will receive -1 bonus points. EDITORIAL CHANGE: 4-4: Umpires receiving the distinction of subsection (h/i) will have shown a regression in ability and might have had a regrettable situation occur in-season. COMMENT: Eliminates one of the two negative postseason UEFL Awards. >> 4-4-h. An umpire recognized as Most Disappointing Season (min. 0 / max. 1 umpire) will receive -1 bonus points. COMMENT: Replaces "Most Declining" with an award whose vision and mission is clearer. >> 4-4-i. An umpire recognized as Worst Umpire of the Year (min. 0 / max. 1 umpire) will receive -3 bonus points. EDITORIAL CHANGE: 4-4. ...Umpires receiving the distinction of subsection (h/i) will have shown a regression in ability and might have had a regrettable situation occur in-season. >> 6-1. Any logged-in person may file a UEFL Challenge. COMMENT: Allows any person logged into DISQUS to challenge/appeal an Original Ruling. >> 6-2-b-1. In rendering QOC regarding a pitch location (ball/strike), Pitch f/x, or Statcast, whose titles shall herein be used interchangeably, shall be the primarily cited source. EDITORIAL CHANGE: 6-2-b-2. ...shall be calculated using pitch f/x, or statcast, data. COMMENT: Acknowledges MLB/MLBAM's change to the Statcast platform while allowing the "Pitch f/x" phrase to continue to be used, so as to maintain consistency in identifying the stats' purpose. >> 6-2-b-5. A balls/strikes ejection concerning multiple similar ball/strike calls during the same at-bat may be deemed irrecusable if the multiple calls were consistently officiated, even if otherwise QOCY or QOCN. May be referred to as the "Meals Rule." COMMENT: Neither rewards nor punishes umpire whose pitch calls were consistent during the eventful AB. >> 6-2-b-5-c. Ejections for the reason of "Check Swing" shall be adjudicated based on whether the batter attempted to strike the pitch as the pitch crossed home plate automatically, be referred to the UEFL Appeals Board for QOC determination. No UEFL Challenge shall be accepted for any such ejection. COMMENT: Eliminates automatic Appeals Board review of check swings and restores the ability of the membership to challenge the Original Ruling via referral to the Appeals Board. >> 6-4-a-3. At-large terms shall be limited to two years one year in length with no term limits. COMMENT: Extends at-large UEFL Appeals Board terms from one to two years (3 elections each year). >> 6-4-a-4. At the conclusion of the season and during the Rules Summit, Appeals Board members may sit for re-election/retention. An absolute majority is required for re-election. If a Board member fails to ascertain this during a first ballot, a run-off may be initiated. COMMENT: Eliminates Appeals Board re-election vote prior to the general pre-season election. >> 6-5-a. In the event that a play under appeal can be conclusively categorized or adjudged as Correct/Incorrect as a result of this action, through the use of conclusive and/or clear and/or convincing evidence, the appeal shall be either Upheld or Denied Original Ruling shall be confirmed or overturned, as specified in Rule 6-4-b-1 or -2, respectively. COMMENT: Aligns language with actual voting terminology used by the UEFL Appeals Board. >> 6-5-b. In the event that a play under appeal cannot be conclusively categorized or adjudged as Correct/Incorrect as a result of this action, through the lack of conclusive nor clear nor convincing evidence, the appeal shall be upheld or deferred, as specified in Rule 6-4-b-2 or -3, respectively. 6-5-c-5-c. NO (Offense) = 0-0, 1-0, 2-0, 3-0 ==> Called Strike. RATIONALE: Changes ball/strike ejection pitch count criteria, specifically related to a 3-0 pitch ruled a "strike." Disqualifies a 3-0 strike from being considered as having "realistically resulted in a different outcome of the at-bat," provided the ejection occurred after the at-bat's conclusion or other subsequent pitch (e.g., an ejection after the 3-0 pitch, but prior to the 3-1 pitch, will still be QOC adjudicated based on the QOC of the strike one call). COMMENT: Turns off guest comments; reduces likelihood of spam, violative, and/or trolling. >> 8-1-h. Any removed comment shall result in a seven-day penalty wherein the offending author may not receive league points for a seven-day period, beginning after comment removal. COMMENT: Creates a stricter penalty for removed comments; eliminates penalty discretion. >> 8-5. A grand prize shall be instituted and awarded to the UEFL member who earns the most points at the end of the postseason. As such, a league entry fee shall be imposed at an amount set by the Commissioner, which must be paid prior to the start of the regular season. Note: Pursuant to Rules vote, participation in the official Umpire Ejection Fantasy League shall remain free of charge to members. COMMENT: Adds a prize for the winner while instituting a registration fee; eliminates free play. The final portion of the Rules Summit ballot will feature 2017 UEFL Appeals Board members seeking re-election for 2018, as afforded by the process delineated by UEFL Rule 6-4-a-4. Click here to view the Board's decisions in 2017. 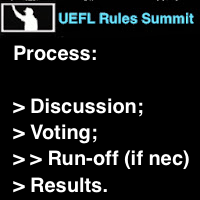 Following the 2017 Rules Summit's discussion phase, voting will occur. No voting shall take place prior to 11/16, until the discussion phase has ended and all proposals become part of the finalized ballot.